Traveling to a European or Latin American country in the near future and want to experience something rare and all-encompassing? Check the national team’s fútbol schedule and if you can, plan on being there during a match. I witnessed this extravaganza in Italy some years ago during the Clásico Mundial, the over 80-year rivalry between the Italian and Brazilian national clubs. It was like a national holiday—most businesses were closed for the match. Groups of fans gathered around blaring TVs in alfresco zinc bars and espresso stalls, spilling out onto unpassable streets clogged with revelers representing both squads, singing terrace chants in Italian and Portuguese. In the end, the Italians were shut out. But as storefront gates began to open and Florence’s Sant’Ambrogio neighborhood shifted back to normalcy, I saw not bitter rivals going separate ways but Italians and Brazilians arm-in-arm and lounging over vino, celebrating the beauty of what they collectively had witnessed. It remains a cherished memory. The nations have an intertwined history, perhaps no more so than in São Paulo—the South American metropolis has the world’s largest population of Italians outside Italy. 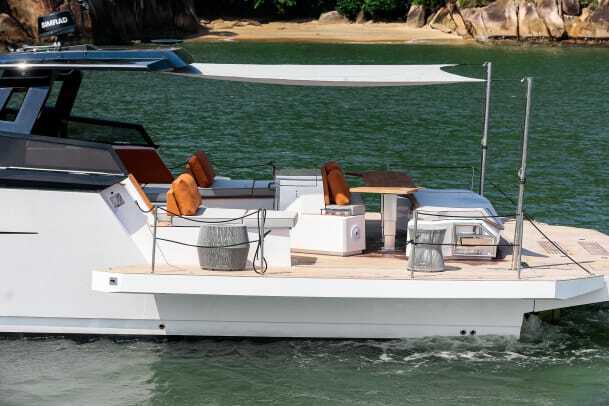 It’s here that Brazilian boatbuilder Nercio Fernandes (his shipyard is located in the adjacent Guarujá district) and Lombardy-based, Ferragni Progetti design studio honcho Paolo Ferragni met. 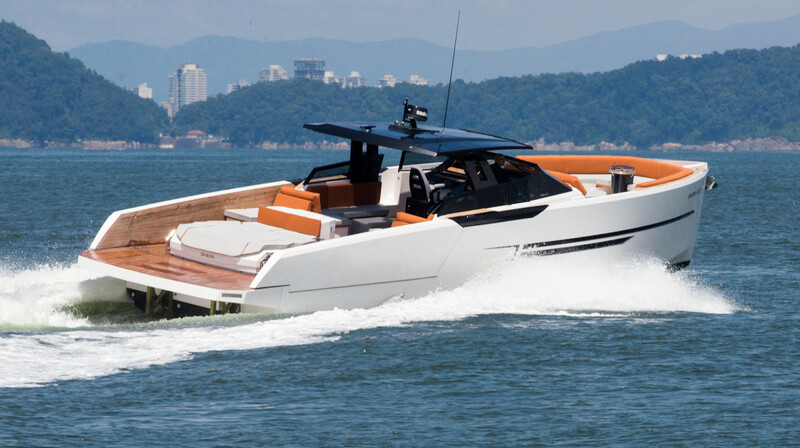 Fernandes knew of Ferragni’s work with several Italian yards and asked him to join forces on a new project. 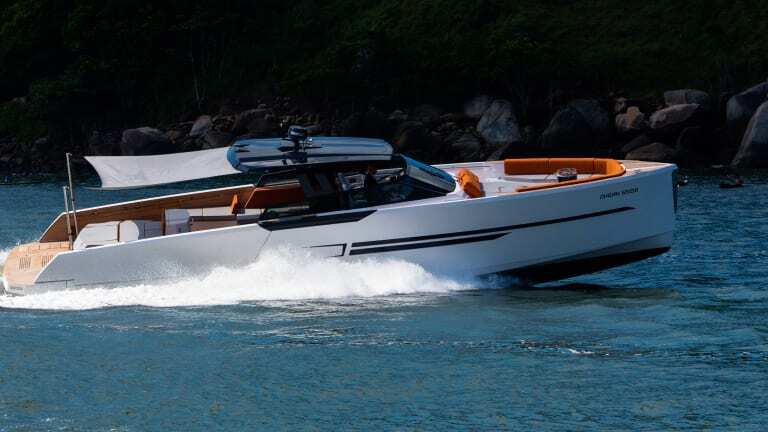 The collaboration’s first launch—the contemporary styled Okean 50—quickly got the attention of the industry vets at HMY Yacht Sales, who backed them in the States. 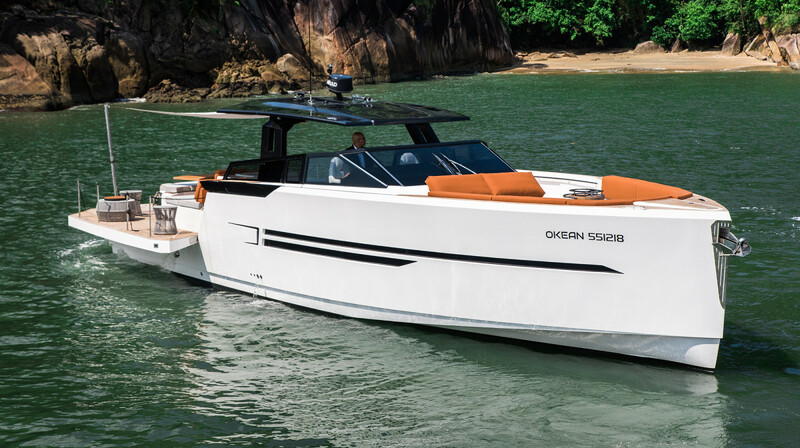 I admired the 50’s profile as she moved along Ft. Lauderdale’s Stranahan River and noted that with Okean’s initial success, they could’ve built a line of handsome, semidisplacement boats in varying LOAs based on her brief. But the boat I was standing on, the Okean 55 Sport, goes in an altogether different design direction. 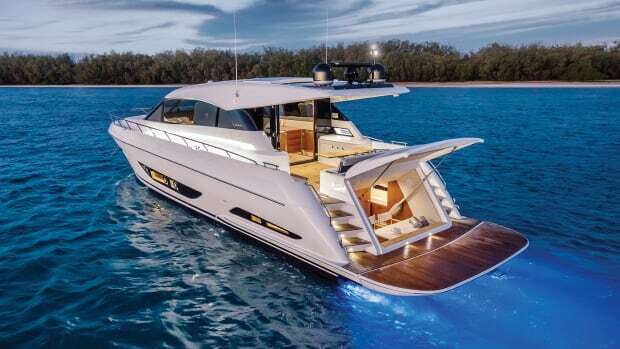 “This is the ultimate dayboat,” Fernandes said as we slowly made our way toward the Port Everglades Inlet. From my vantage point just aft of the starboard-side helm—enjoying the breeze that came freely between the low, raked windshield and carbon fiber hardtop—I had to agree. 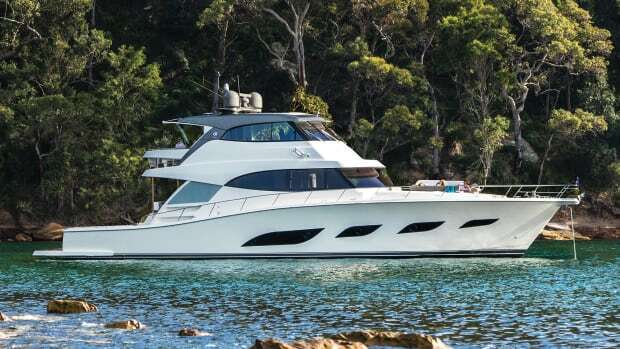 The layout and features on both the open deck space and area protected by its hardtop are varied, commodious and take full advantage of her 15-foot, 6-inch beam. 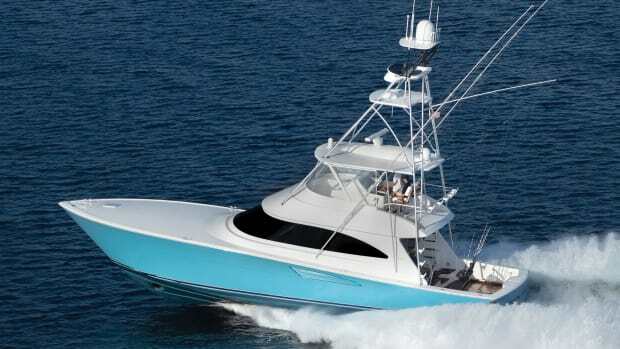 Two amidships, aft-facing sunpads—with another bench/sunpad just forward of the 55’s open stern—flank a centerline galley, with a BBQ grill, cooktop, wet bar, icemaker and refrigerator. 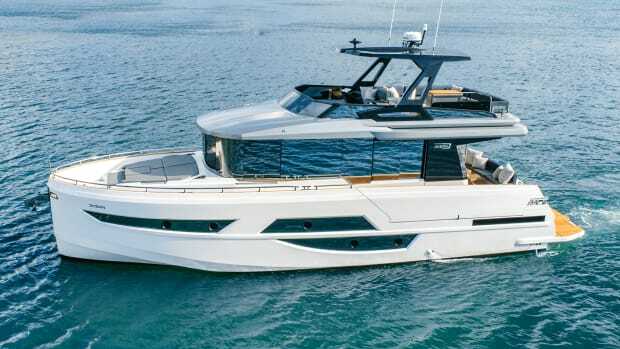 I imagined searing ahi steaks here and looking aft at a half-dozen friends seated comfortably for an alfresco lunch, with room for eight more sunseekers on her foredeck. Both areas can also be shaded by bimini tops secured to carbon fiber poles. (They’re an ease to set up; I watched dockside as two HMY employees took a few minutes to unfurl and dog down.) Have ten more friends that want to join? No problem—L-shaped seating under the hardtop will fit them with room to spare. A flick of a few switches opens her up even more—literally. 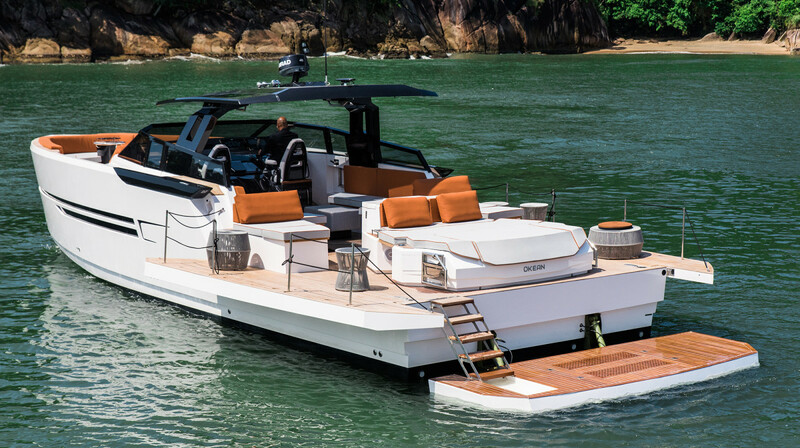 Like the 50, the 55 Sport has hydraulic side coamings that, once deployed, give the vessel over six more feet of beam on balconies flush with the swim platform and rest of the above decks area. “It’s like a villa on the sea,” Fernandes said. Again, I’d concur with Fernandes: she’s a teak-decked-clad winner. 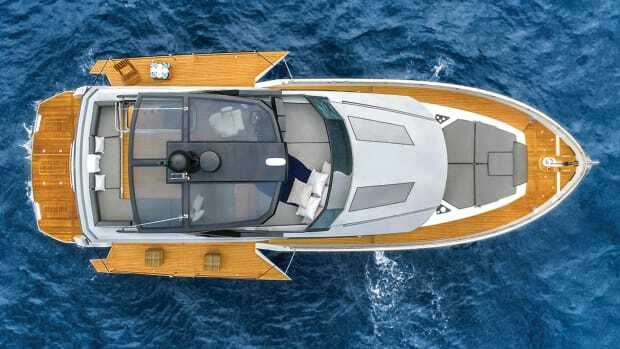 Moored at a secret shoal or on the hook at a favorite cove, the balconies—combined with her open stern—offer a beach club rivaled only by much larger vessels. 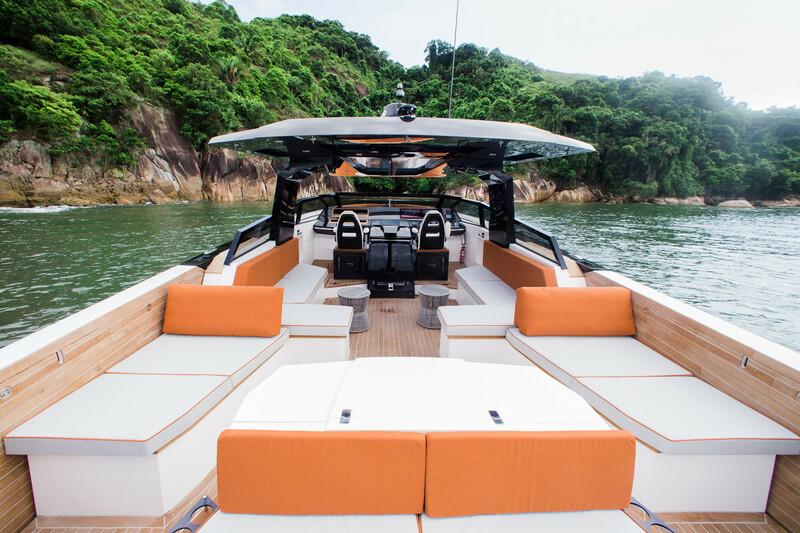 If the wind picks up, or other boaters’ wakes threaten your steady seclusion, just spool up the optional Seakeeper 6. It’d be a fine way to wind away a summer afternoon. Once we reached the Atlantic, we ran side-by-side with the 50 for a few minutes, then blasted by. 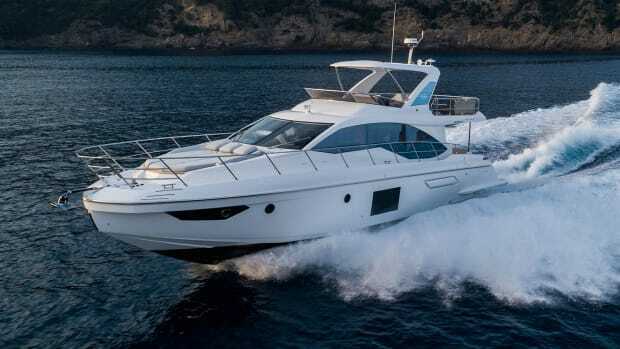 At the helm I found the 55 to be a vigorous performer, the Volvo Penta Electronic Vessel Control system suite—twin IPS800 pod drives, smooth-shifting electronic throttles, fly-by-wire steering and joystick—ideally matched to the 55’s moderate-V hull. Sightlines are excellent in all directions. She tracked beautifully, leaning hard and steady into 27-knot turns with no loss in rpm, and the Zipwake dynamic trim obviated the need to tinker with the tabs. The waters just off Ft. Lauderdale were quite busy. Dozens of vessels moved out from their boat show quays and steep, three- to four-footers in their wakes. The 55 handled the confused seas well, with nary a squeak; this is a solidly built vessel. I did notice when idling down from speed that the open transom allowed some water to splash the decks; it quickly drained and didn’t present any issue. Kudos to the hull design. With the pins down, we saw an average two-way speed of 32 knots, pretty respectable given the conditions and our full load of fuel and water, plus six on board. Fernandes told me the boat ran at 39 knots with 11 people on board in Brazil, before freighter transport to Florida. Arthur Grin, Okean’s brand manager confirmed that a prop dinged during offloading was to blame. Vacating the helm, I stood to port of the centerline companionway to below decks and noted the area could use a handrail; Grin agreed and said this will be added to later models. 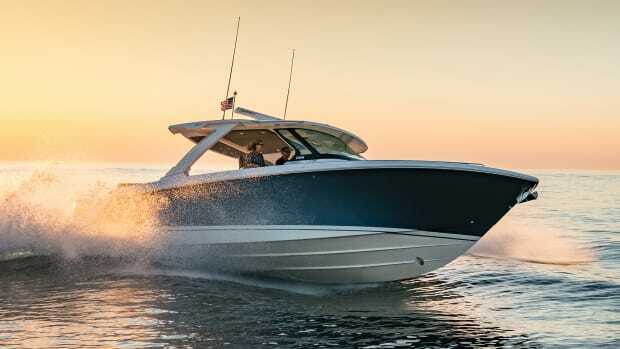 Grin also mentioned subsequent models will have a solid hardtop; the small, fixed windows on Hull No. 1 serve little purpose. It will also match well with the 55 Coupe—an $85,600 upgrade that includes full glass enclosures on three sides with aft, stainless steel sliding doors and more BTUs for the salon’s air conditioning. I applaud Okean’s other variations on the theme, including three optional belowdecks layouts—our test boat had a queen berth in her forepeak and a split head and shower. A couple would be comfortable and cozy on the hook. 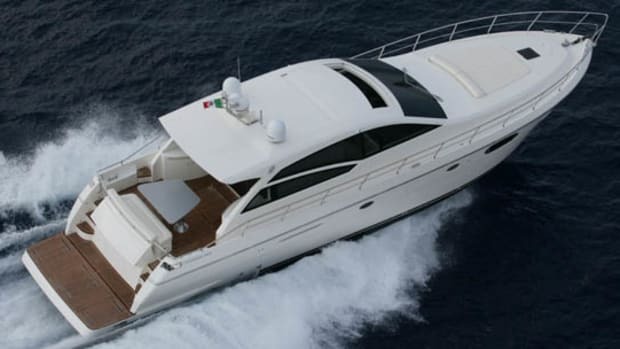 But I feel like more accommodations here robs the 55 of its raison d’être: A very stylish, capable dayboat, chasing megayachts on the Med or photobombing a paparazzo’s clandestine shutter clicks. Back on terra firma, I was commending Grin on the 55’s outdoor galley. He smiled and mentioned that the engineers have figured out a way to add a 70-inch TV that will rise from the back of the unit. If I can’t be in São Paulo or Florence for the next Clásico Mundial, I’m confident I found a fine alternate location. Test Conditions: Seas: 2-4 ft.
Load: full tank fuel & water, 6 people on board. 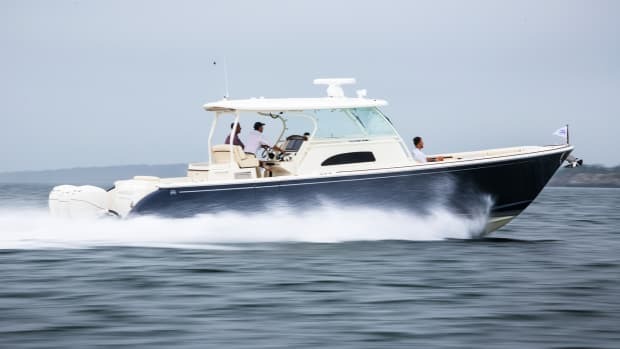 Speeds are a two-way average recorded by a Simrad multifunction display. GPH taken via Volvo Penta engine display. Sound levels measured at the helm. 65 dB(A) is the level of normal conversation. Range is based on 90% of advertised fuel capacity.